Hugo Award Winner! Miles Vorkosigan graduates from the Academy, joins a mutiny, is placed under house arrest, goes on a secret mission, reconnects with his loyal Dendarii Mercenaries, rescues his Emperor, and thwarts an interstellar war. Situation normal, if you're Miles.. The Vor Game starts right after The Mountains of Mourning when Miles, just graduated from the academy as a new Ensign, is given his first assignment. It's a baffling one. He's to be meteorology officer at a remote station in the Arctic. When he asks, he's told that as long as he keeps his nose clean for the 6 months of his assignment, he'll be given the ship duty he craves. If only it was so easy! Things, obviously, go wrong, and Miles ends up attached to Imperial Security and sent on a mission for them, trying to use his Admiral Naismith persona to help get intelligence on what exactly is going on in a nearby commerce hub. There have recently been some disturbing developments and Impsec want to know who's behind them. And yes, despite Miles' best intentions, things go wrong again, and Miles is suddenly involved in an extremely hairy situation, trying to survive and protect an unexpected companion. Ok, so objectively, the structure of The Vor Game shouldn't work. I thought as I was reading it that the big chunk at the beginning, when Miles was on Camp Permafrost, felt completely independent from the rest of the book and actually pretty self-contained. There's a reason for that. It turns out that this section was originally a short story and was later incorporated into this longer book. It should have been an issue, but it wasn't. I enjoyed the insight into what kind of officer Miles had turned out to be (a morally corageous one with issues following orders) and when that bit was over, I was very ready to see what came next. What came next was the kind of derring-do I expected from him. Miles is given a mission where he's absolutely not supposed to exercise any initiative. His "Admiral Naismith" identity will be useful to the mission, but he's supposed to just play his role and let someone else do the actual intelligence work. Exactly the wrong sort of job for Miles. He's constitutionally unable to not see a better way of doing things, and he's usually right. He does try, bless him, but as soon as he's in a situation where it's even remotely plausible that he had no choice but to act on his own, he's off. The adventure he embarks on is fun. I must admit I lost a little bit of interest during the sections where Miles was bouncing around, always on his back foot. That didn't last long, though. As soon as he realised "this is what I'm going to have to do", I thought it gathered the necessary momentum and fairly flew. At the end, on the crucial moment, I actually cheered out loud. As usual, I loved the humour, but particularly appreciated the undertone of seriousness, especially regarding Miles' companion on the trip and the reasons why this person ended up with Miles. It's subtly done, but very clear, and gives us so much more about what kind of person this man has turned out to be (cryptic, me?). 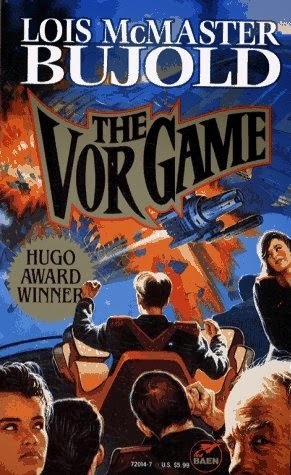 One of the many benefits of reading your reviews of the Vorkosigan series is seeing words and names--Impsec, Dendarii--that I hear imperfectly in the audiobooks. What a great entry THE VOR GAME is; if there are serious missteps in the series, I don't want to know. Thanks. Heh, I listen to them as well, so I have to check the names before doing the reviews. There's actually a Vorkosigan wiki, so that's quite useful! I've never read anything written by Bujold. I've seen great reviews of this Vorkosigan series. Now your review makes me thing I should start reading it. But what scares me away from reading these books is that I don't see any foreseeable end to the series. @Bona - I hope you're right and Bujold writes more but 'Cryoburn' read like an ending to me, with 'Captain Vorpatril's Alliance' a kind of cheerful coda to the series. @Rosario, I'm enjoying your reviews of them all. I agree about the structure of this one - it reads a bit cut 'n' shut - but with both halves worth reading. Bona: I completely agree with Marianne McA about even the early books in the series working very well as stand-alones. If you definitely want something self-contained, maybe try the two about Miles's parents (Shards of Honor and Barrayar). Marianne: Thanks! I think Bujold gets away with things that other authors may not, just because the stories are so good. Thank you very much for your help. Definitely, I'll give it a try.